Hello crafty friends! I have a quick Holiday card to share today using a few new Holiday 2016 dies from Spellbinders. This card has a little shaker element incorporated into the Christmas ornament. I used a few basic dies plus new Holiday 2016 sets to create this card. The shaker is built into the white ornament and is filled with little clear beads from Pretty Pink Posh; its not obvious right away and makes up for a nice surprise for the recipient. 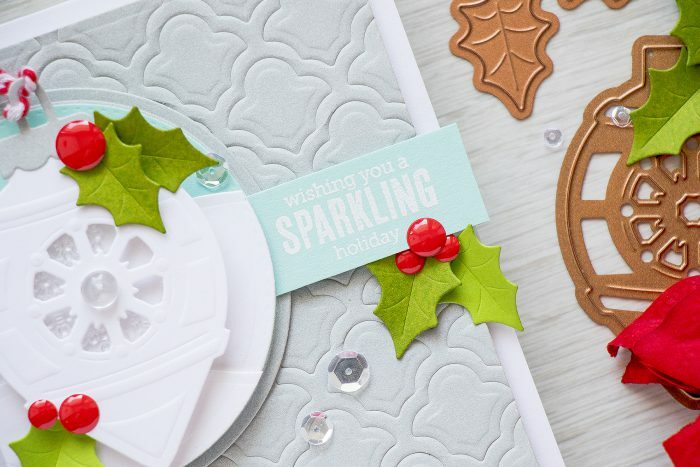 To create the embossed background I used Grateful Lattice die and instead of cutting it simply embossed in on a piece of light gray cardstock. I love doing this and I’ve shared a few cards previously using the same trick. I didn’t use any patterned paper for this card, just a few colors of cardstock. To create berries for the holly leaves I used bright red enamel dots. 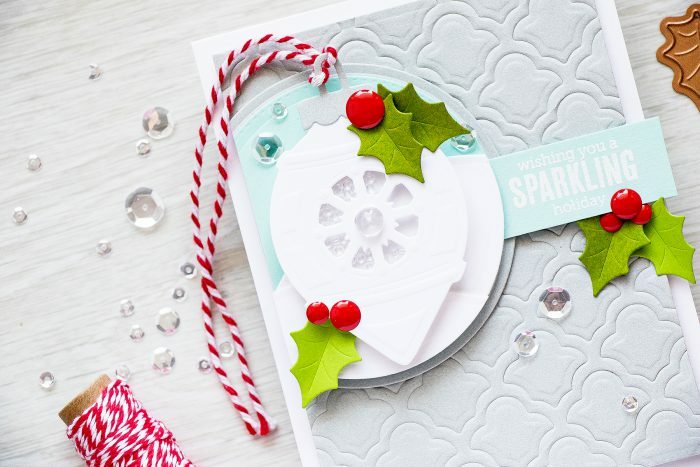 The sentiment, Wishing You a Sparkling Holiday, was heat embossed in white onto light blue cardstock, I think it a great one for this card because the ornament die cut does sparkle a bit. Gorgeous Yana! I love the soft colors with the pop of green and red. 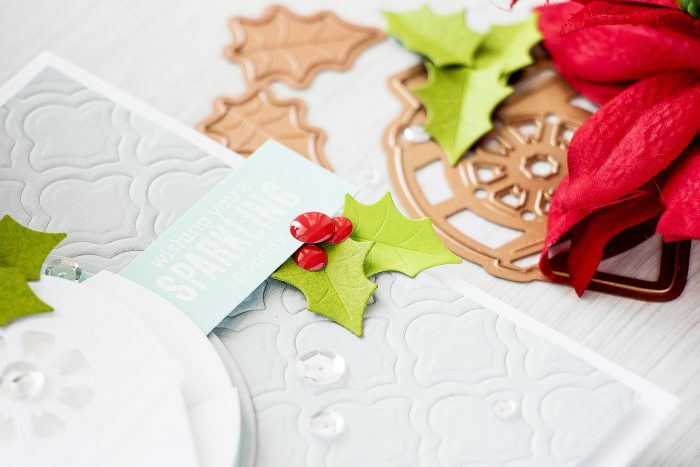 Great tip on embossing, I can’t even tell you how many times my paper cracks. Love that you snuck in a little shaker on the card. I was reading Vicki’s post from Twinkling Paper Studio and it was like she wrote my exact thoughts, “While there are many designers whose work I like, I think Yana is the one I most want to be like.” I love your work, your one of my fav’s. Thanks for sharing and inspiring. Very beautiful! Such a great color combo. Unusual for Christmas but so cool!